My intended audience is an Anchorage 10th grade biology class. I am factoring this lesson will take up three 45min class periods. 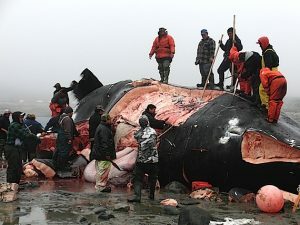 The essential question for this lesson is how much of an impact does climate change have on whaling for the Inupiaq people of the north coast of Alaska? I plan to acquire more. Perhaps embedded in a unit on Cetaceans I’d do this lesson. For the first class I’d like to go over the background knowledge needed for this exercise. First looking at Bowhead habitat and niches. Secondly, I like to look at what a hunt consists of. Thirdly, I’d like to go over the impacts of climate change in the area. Generally speaking the fist class period will go over the Bowhead whale and whaling of the Inupiaq people. The Second class will look at climate change over the Inupiaq area and what they have done to adapt. For the final class I was thinking of splitting the class up into pairs and have them come up with a budget analysis of hunting Bowheads now in comparison to 40 years ago. Some questions I’d like students to investigate: Does it cost more to hunt Bowheads today? Is it worth it? What now are the associated risks? If you had to depend on that as a resource for your livelihood what new strategies for hunting whales can you come up with? Of course, I welcome any suggestions. I like the idea of digging deeper on the technology and economics of the hunt and its costs and benefits. You could create opportunities for students to compare historical and contemporary methods and how they have adapted to impacts of climate change. It also has many cultural components which could enhance things without distracting from the biology instruction. Since whale hunting is a controversial subject to some. I’m wondering if there is a way to include the indigenous perspective on the hunt and the “respectful” manner in which it was conducted. That could be compared to the more high-tech “industrial” harvesting of animals. Previous Previous post: Idea- Arctic Circle and Earth’s Inclination.